Kharkiv, Ukraine – January 5, 2017 – AltexSoft, a Technology & Solution Consulting company, was ranked one of the best IT employers in Kharkiv, according to DOU.ua. In 2016, the company placed third (link in Russian) among 35 contestants in the Kharkiv region and earned the rating of 98 out of 100 with 56 submitted reviews. 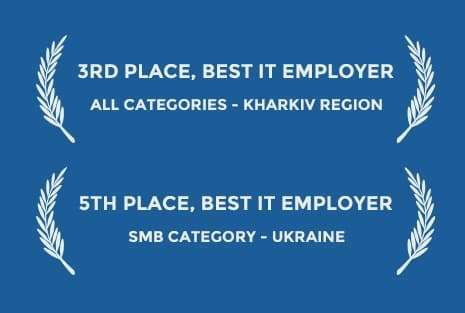 Meanwhile, among the Ukrainian IT companies with 81 to 200 workers AltexSoft placed fifth best employer out of 62 companies. The rating system is based on seven categories: potential for professional growth, comfortable work conditions, qualified management, total compensation package, company’s recognition of one’s work, established communication and welcoming atmosphere. This result matches the AltexSoft’s vision to create the most inspiring environment for IT specialists. Over the past years, we have reached the top scores in Kharkiv region and country-wide twice. AltexSoft has topped the best employer rating in Ukraine in 2014 and placed sixth in 2015. DOU (formerly, DevelopersOrgUa) is an online community of developers dedicated to providing news and announcements in IT, sharing industry insights and experiences. It’s also responsible for creating one of the most reliable rating systems of IT-employers in Ukraine. Today DOU.ua unites 150,000 users and collects 2,000 IT job offers from 700+ companies each month.